I am too old for this, I told myself, as the alarm chimed brightly at 3:25am. I crawled out of bed, pulled on my yellow “Equal Voice” tee shirt, and my grey and green tennis shoes (the ones that make me look like I run faster than my speediest thoughts), and headed out the door. 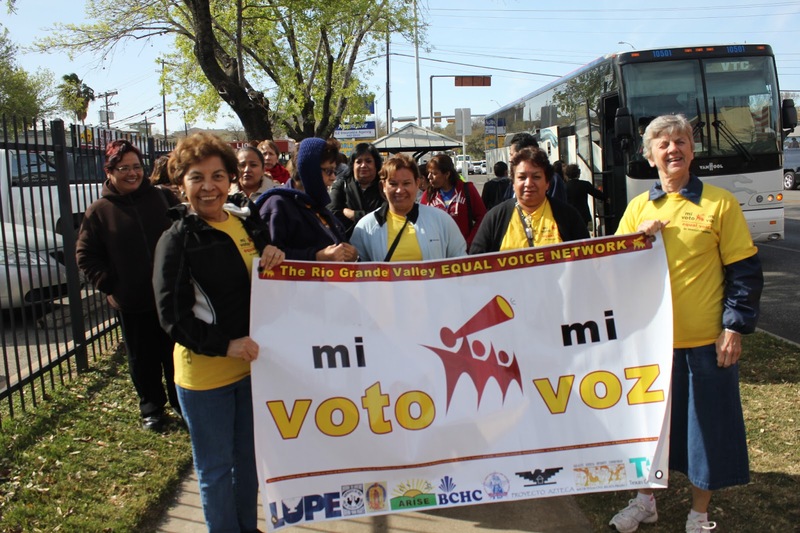 I was joining 54 other people from Brownsville to make a six-hour bus trip to Austin. 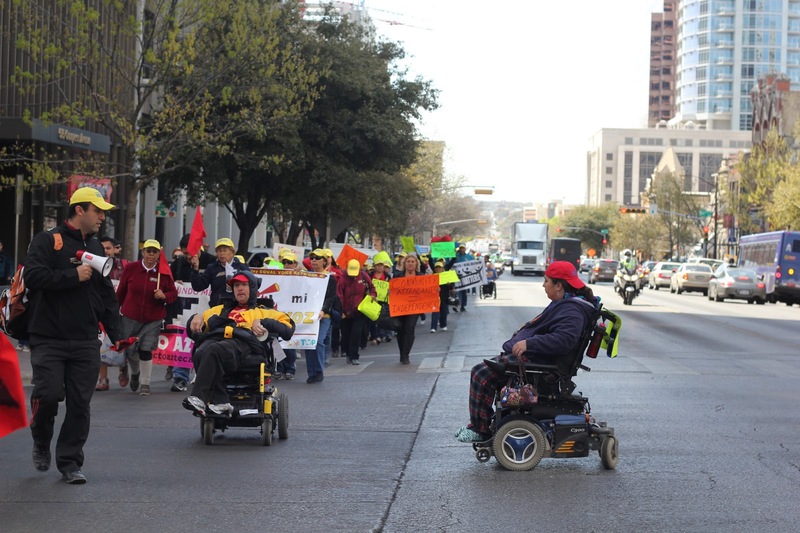 There we planned to march on the capitol with about 3,000 other people, to urge the Governor of Texas to accept the Medicaid Expansion part of the Affordable Care Act. Rick Perry has said that Texas can take care of its own poor people. Texas has 6.2 million uninsured people. Over a million of them are children. None of us are happy with the way Texas has taken care of its poor people. That is an item worth fighting for, we had decided–thus this early-morning activity. I am pleased to think that I will get to the bus a little early; maybe I would get an aisle seat—or even a front seat. As I pulled into the parking lot, though, I saw that I am amongst the last to arrive. As I clambered aboard the bus, I was handed a bag with a potato and egg taco and some cookies in it. Sister Phylis Peters, a Daughter of Charity, has saved me an aisle seat, for which I am grateful. Sr. Phylis is one of our heroes down here. After a few moments with her, I always feel that I should retie my flashy tennis shoes. Otherwise, there is no way that I could keep up with her. 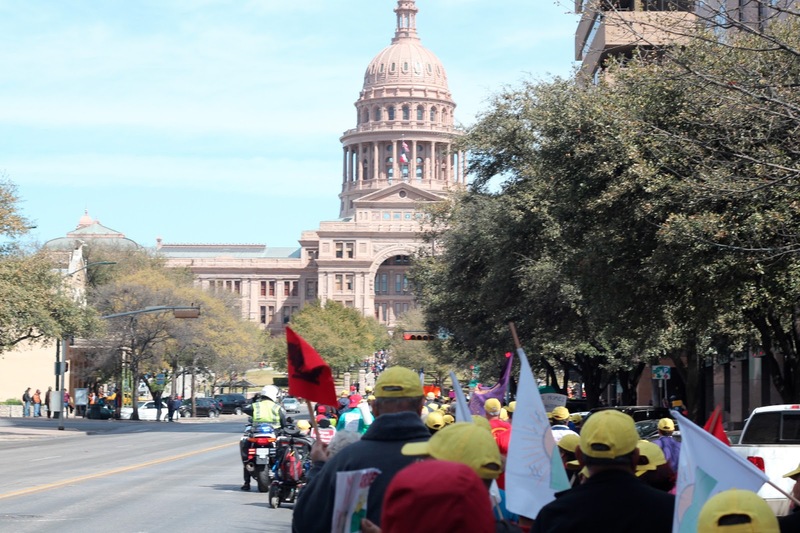 We arrived in Austin in due time, found our place in line, put on our yellow caps, and joined a sea of people from all across the state to make the long walk up Congress Avenue. I was delighted to see fifty or so folks in wheelchairs—over the years I have learned that disabled people are fearless when it comes to raising their voices. And so we raised our voices—on the capitol steps and in the offices of elected officials. Our message was simple—Medicaid Expansion will insure hundreds of thousands of Texans. If we refuse the expansion, the monies will go to another state who has acted on behalf of the uninsured, and has accepted the expansion, some place like New Mexico, or, God forbid, Arkansas. Nearly half of the representatives in the Texas State House are new to their job. Many of the reps that we visited had no idea what we were talking about. But the organizers of the protest (Texas Well and Healthy) had done a great job, and the written material was clear and to the point—and well footnoted. There was a bit of a pause, and then Gabriela added, “You know, this wasn’t about me. It was about my mom and her getting insurance. That’s important to me.” She looked down at her phone and began texting someone. I settled into my seat and thought for a bit about civic engagement and the young woman who was going to end up spending twelve hours on a smelly bus, who had spent three hours walking and standing around in a protest and who had been humiliated in the offices of an elected official. I reached down and retied my shoes, for I was surrounded by fiery women, and I best be ready to keep up with them. As for Rick Perry, he wears boots.